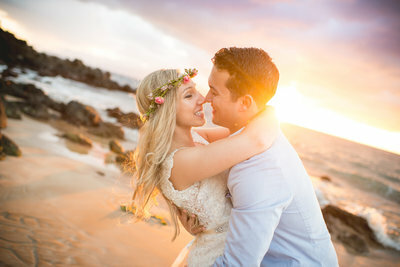 A truly incredible Maui Destination Wedding! The bride arrived to Southside Beach in a classic Maui Roadster with her dad. Such a fun idea! We love that they were able to spend time alone just prior to the wedding for a little daddy daughter moment. Samuel could hardly contain his excitement to be marrying the love of his life, as Samantha made her entrance arm in arm with her father. This was a truly touching moment and we are so honored to have witnessed it! The couple chose to include their wedding guests in the festivities by presenting each of them with a white orchid lei prior to the ceremony taking place. This is such a fun way to let your guests know how much you value their love and support! The groom’s mother even surprised the happy couple with a bag of petals for a celebratory picture after the couple said, “I do.” So sweet! Samantha was breathtakingly beautiful in a Liana Wedding Dress! And just check out her long luscious locks, would you believe us if we told you it’s all her real hair? Because it is! We could hardly believe it ourself, the stylist at Salon 253 was even amazed! She wisely chose to have key pieces of her hair pulled back, to help keep the wind from blowing strands of hair in her face while still showing off her gorgeous curls. Samuel made for one rocking groom in a navy suit, subtle patterned tie, and fun pineapple print socks! 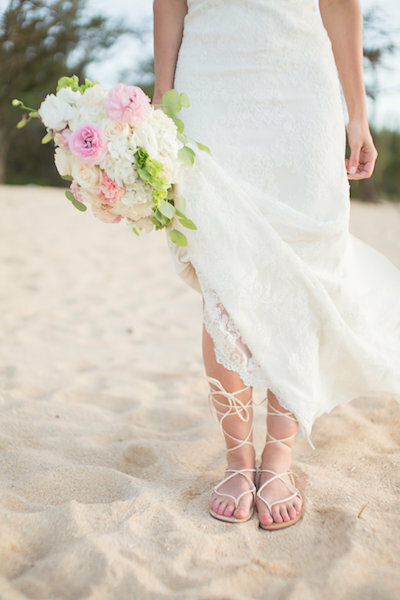 The perfect look for a Maui Destination Wedding. It’s easy to see they are one stylish couple, but that’s not all they have going for them! They are also incredibly sweet and couldn’t be more in love. 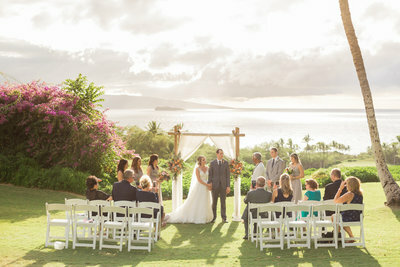 Thank you, Samantha and Samuel, for letting Simple Maui Wedding join in celebrating your marriage! We wish you a lifetime of happiness as husband and wife. Congratulations and Warm Aloha!